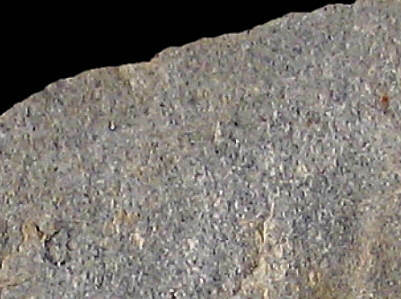 Material (geologic): middle Bathonian of the so-called "limestones with flint" formations, or transition with the so-called middle Bathonian "choin" (building stone) formations. Mode of occurrence: Abundant, large ramified nodules. Cortex: Fresh, rough, pale greyish tan, 1 to 1.5 cm, transition more or less sharp. Colour: Blue-grey (N6 to N7). Pattern: Barely visible dark specks. 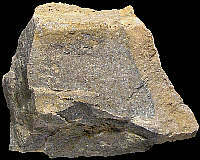 Appearance: Homogeneous material, dull and opaque, slightly rough, moderately fine-grained. Structure: A few convoluted bioturbation figures and dark micritic streaks. Grains: 30 %, white, yellow, black, subangular with high to low sphericity, well sorted (125 µ) with rare elements of 1000 µ. Grain composition: Reticulated background as in Bt2a and Bt2b; very numerous foraminifera showing as "ghosts" outlined by impurities, numerous thick-walled sponge spicules, rare thin-walled spicules, microfilaments (Posidonomya test sections), rare serpulids, pelecypods fragments (1 mm). Remarks: Although the samples were collected in primary context in the so-called "limestones with flint" formations, they could belong to a transitional facies with the "choin"; the differences with Bt2a/b pertain mainly to the very high density of foraminfera, the presence of sponge spicules and bioturbation figures; the last two elements are characteristic of the "choin" formations (Enay 1982). Geographical description: As the name already indicates, the sampling site is located at a hairpin-bend, which is to be found in the departemental road D 34, shortly after it leaves the N 504 to Oncieu some two kilometres east of St-Rambert-en-Bugey. Co-ordinate precision: The coordinates given were taken from a large-scale map, and are well within 50 metres of the actual spot. The latitude/longitude coordinates are a direct transformation of these data on WGS84 and are accurate to the same level. Geology: According to the geological map, the substrate belongs to unit J2 of the Middle Bathonian. Map of all sampled localities of bathonian flint in the Bugey (PDF, 195 KB, opens in new window). Other types of flint: All flint from this site is of the same type.